The Keene highbanker 2.5" gold dredge combos are a lighter weight, less expensive alternative to the standard 3" combo units. These units are relatively affordable and easily transported so perfect for day trips and mobile prospecting. The key to this highbanker is the very light weight yet powerful P90GH motor and pump. This versatile machine is equipped with a 2.5 inch suction hose and nozzle for dredging. Combination units are ideally suited for shallow water areas with the power sluice being so simple to set up and requiring less water then a standard dredge to operate. Note that for proper operation and good suction power the sluice box should be set as close to water level as possible. Attempting to lift too high vertically will result in excessive clogging. The KEHBCK25 is built around a KEA52 hand sluice which has been converted into a power sluice by adding additional components. This package includes the following components: 1. 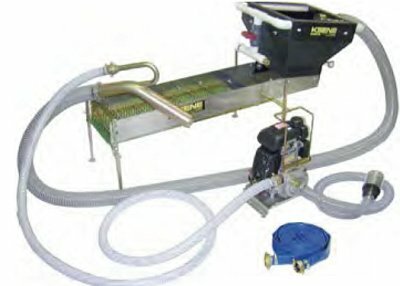 Hand Sluice, Hopper Conversion Component, Frame with Adjustable Support Legs, Sluice Trough Extension, Engine, pump, intake assembly and pressure hose, One 12' x 1 1/4" coupled pressure hose, Dredging Riffle, Classify Screen, 10 Feet 2.5" Suction Hose, and 2.5" Suction Nozzle. Weight 88 lbs.